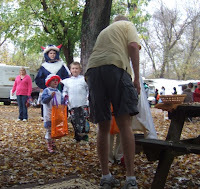 We arrived at the Asheville East KOA when trick-or-treating was about to commence. We setup in record time and Paul made a last minute run out for candy. We were so excited! This was our first batch of trick-or-treaters in 10 years! With 100 or so kids parading around the park, we actually ran out of candy. What fun! With the happy goblins back in their campsites, we took a stroll around the campground to see the scary - and not so scary - sights. We think we're going to enjoy our week here. 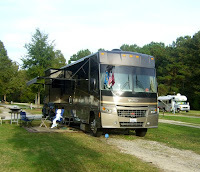 We crossed the Cooper River and found our way to the Charleston Visitors Center. There we learned that the town highlights were within walking distance. 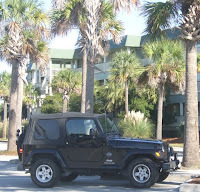 So, we kept the Jeep parked and strolled down Meeting Street, aka "Museum Mile" to take in the sights. 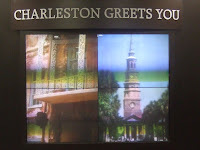 Charleston is nicknamed "The Holy City" for a couple of reasons. First, and most obvious, is the preponderance of churches on the city skyline. 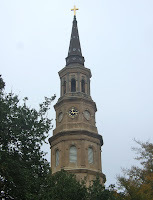 The second, is the Charleston was one of the first cities in the original 13 colonies to provide religious tolerance to the French Huguenot Church and one of the first colonial city to allows Jews to worship without restriction. 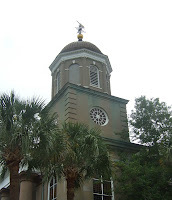 Today there are churches everywhere you look in downtown Charleston. This is Citadel Square Baptist Church. A quick turn in the opposite direction from that one, we saw another. This is St. Matthew's Lutheran Church. This is Trinity United Methodist Church. Imagine how striking it would be against a blue sky! But, with today's overcast it was not meant to be. We just couldn't walk far without seeing a church. Here's another: Circular Congregational Church. 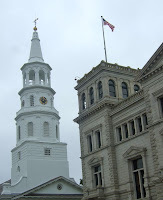 The Four Corners of the Law is a local term for the corner of Meeting and Broad Streets in Charleston. 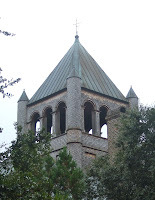 St. Michael's Episcopal Church stands on one corner. A Federal Courthouse and Post Office are on another. The two corners across Broad Street are occupied by the Charleston County Courthouse and Charleston City Hall. 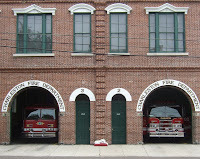 This charming building houses Engines 2 and 3 of the Charleston Fire Department. I can't imagine backing a fire engine into one of those little cubbyholes! If you look closely, you'll see a Dalmatian resting on a red cushion between the two bays. The CFD has a sense of humor! 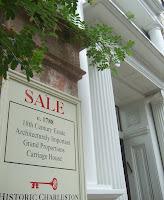 The majority of our self-directed walking tour was spent admiring Charleston homes. They are magnificent! Oh look! Another church. This is First Scots Presbyterian Church. 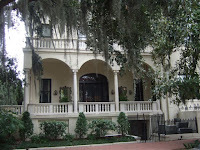 Stately old homes framed by grand live oaks dripped in Spanish moss. Lovely. 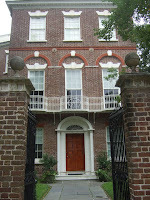 The Historic Charleston Foundation maintains museums in two of Charleston's grand jewels. 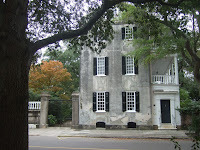 This is the Nathaniel Russell House, a Federal style townhouse that was constructed circa 1808. 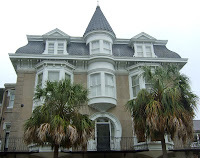 Many of the homes in downtown Charleston are historic landmarks that are still used as private residences. I just couldn't stop taking pictures of these beauties. When we reached the end of Meeting Street we circled around the battery and strolled up East Battery to see more of these antebellum homes. Each house has its own distinct character. They are simply gorgeous. Can you just imagine spending an afternoon on one of these stunning porches? 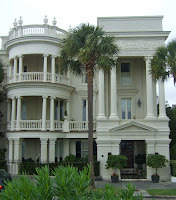 If your interested in having your very own porch in Charleston, we spotted several for sale. This sign says this place has "Grand Proportions". We think that might translate to "grand price tag". 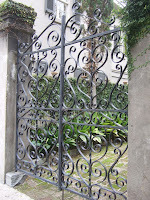 We've seen lots of ironwork around the South. 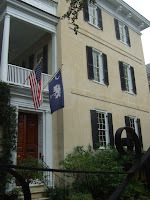 In downtown Charleston many of the homes feature iron gates. Behind the gates you may find magnificent side gardens like this one. This is a private residence that had its gate open with a sign welcoming passersby to enjoy the view from the street. 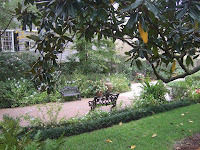 This is the side garden at the Nathaniel Russell House. 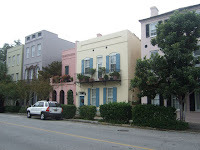 One of Charleston's most photographed streets is a stretch of East Bay Street known as "Rainbow Row". These are just a few of the vibrant old row houses in this district, which represent the first style of Charleston homes and were portrayed in the story of Porgy and Bess. Whatd'ya know? There's another church. St. Philips is located on very aptly named Church Street. Just outside St. Philips, we spotted this car that reminded us that Halloween is just around the corner. With our day of sightseeing behind us, we settled in for our last night in Mt. Pleasant. Our gray and cloudy day ended with a dramatic sunset over the little pond here at our KOA. 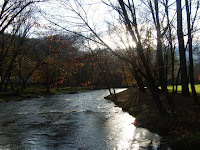 Tomorrow we leave the Lowcountry and head for the hills of Asheville, NC. As we were driving toward the Mt. 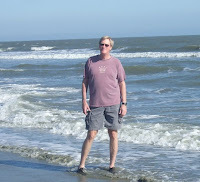 Pleasant KOA yesterday we saw a sign pointing toward Isle of Palms, just seven miles away. 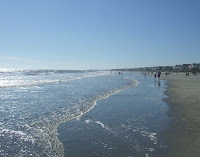 After checking in we learned that the Isle of Palms is where you go when you want to go to the beach. With 75 degree temperatures and a bright blue sky, today was the day to do just that. As we crossed the connector bridge to the barrier island we met our old friend the Intracoastal Waterway. 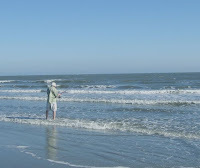 Originally named Hunting Island and then Long Island, this seven mile wide by one mile long stretch of paradise is now home to 5,000 permanent residents and ten times that in peak tourist season. Wouldn't one of these colorful villas be a beautiful place to spend a vacation steps away from the beach? And, what a beach it is. The sparkling Atlantic with its smooth sandy shores is so much more approachable than that other ocean we hung out next to for so long. This inviting scene just calls for a long stroll. But, first, pictures! 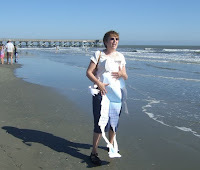 We unfolded our paper niece for a requisite shot of the ocean. What's funny about this picture is I'm responding to a woman who was running toward me on the beach yelling "Is that a Flat Stanley?" Why, yes. But, actually, it's a Flat MC. We had a fun chat about our flat traveling friend. Flat MC and I traded spots with Paul and he took his turn sticking his Keens in the warm water. What a delightful day! There's something very peaceful about the beach. 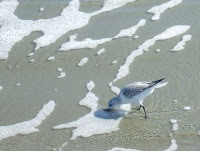 We had a great time watching these little guys run up and down the shore in search of food. 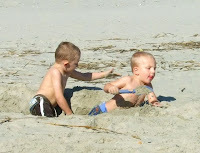 And these little guys were having the best time! This big guy seemed to be enjoying his day, too. Even Rocky got into the act. Doesn't he look relaxed chilling out under the palms? Back on the mainland, we took a cruise through Patriot's Point. From here we could see the USS Yorktown and the Ravenel Bridge. They're both very impressive! From the point we caught a glimpse of Charleston across the Cooper River. We could see from here why its known by some as the "Holy City", but we'll see for ourselves tomorrow. 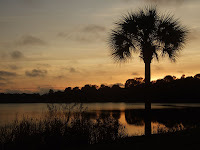 Besides being our route back to the KOA, Highway 17 north of Charleston is also known as the Sweetgrass Basket Weavers Highway. 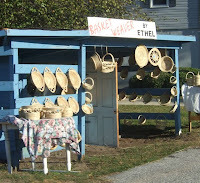 Sweetgrass basket making is unique to the Gullah people of South Carolina's Lowcountry. The Gullahs are descendants of African slaves who worked the South Carolina plantations, where they made and used the baskets to collect and carry vegetables and store other foods. Today, this highway is lined with keepers of this ancient folk-art tradition, who sit at hand constructed stalls like this one and weave sweetgrass and pine needles into beautiful works of art. We traveled about 150 miles today to the Mt. 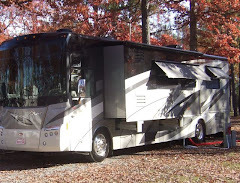 Pleasant/Charleston KOA. 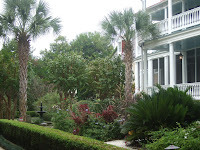 We're 10 miles from historic Charleston and 7 miles from the beach. The forecast for the next few days: Ahhhhhhh! 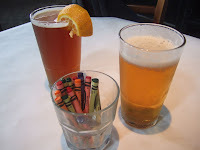 We have great wifi here, so we'll catch up on the blog, too. More soon. Savannah is a very walkable town, but it is a bit spread out. One of its most prominent features are the 21 squares that dot the landscape in the various districts. 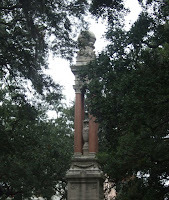 This monument to William Washington Gordon, the first president of Georgia's earliest railroad, stands in the center of Wright Square. A visitor could spend a few days in Savannah seeing all of these squares, but our trolley made sure we saw the most notable in just a couple of hours. 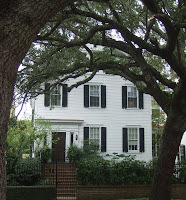 Several books and movies have been set in Savannah. 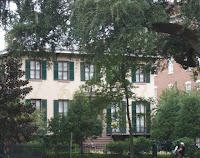 Its antebellum homes and big oaks draped in hanging Spanish Moss have served as the backdrop in the '90s for the films "Forrest Gump" and "Midnight in the Garden of Good and Evil", which was based on the book by John Berendt. Our tour included lots of tidbits about "The Book" as it is known here. 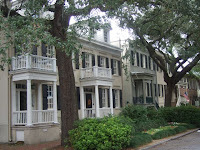 Here's a pretty typical row of townhouses in historic Savannah. 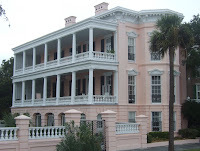 As a long-time member of the Girl Scouts, I took particular interest in this former home of its founder Juliette Gordon Low. As every Scout knows, she started the organization here in 1912. Savannah has a reputation for being America's most haunted city. 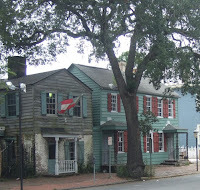 Pirates House is the city's oldest building, and - reportedly - its most haunted. In the 18th century it served as a rendezvous point for pirates. Today it's a popular restaurant. 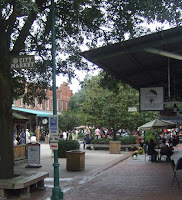 Savannah's City Market is a two-block area filled with restaurants and art galleries. It looks like a great place to hang out. But, we had to keep moving! Today City Market hosted a Halloween costume contest for dogs. 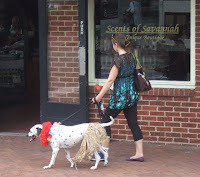 We saw many dressed up mutts, including this spotted hula dancer. 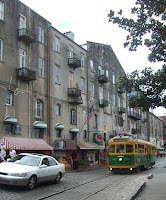 Fans of the Food Network know Savannah as the home of Paula Deen. When we passed by her restaurant, Lady & Sons, it was booked for lunch and dinner, as it is most days. Reservations are not accepted, so patrons line up at 9:30 a.m. each day in hopes of getting a seat sometime later in the day. 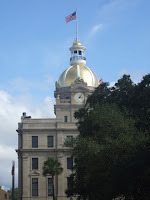 Savannah is also known for its City Hall topped with a 23-karat gold dome. A local philanthropist donated $200,000 to the city to transform the dome from green paint to shiny gold. In 1987 the job was complete, and the town's mayor declared the gilding "a jewel on top of this lovely place called Savannah." The Savannah River Queen is a replica of a 19th century stern wheel riverboat. 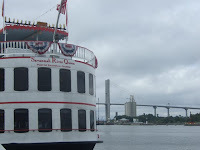 Visitors can choose from a variety of cruises to experience Savannah from the river. Their "Murder Afloat" mystery cruise is just perfect for this town! 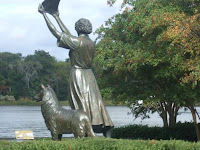 "Waving Girl" is a charming sculpture near the river's edge that commemorates Florence Martus. 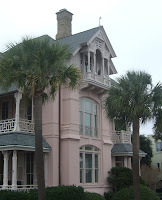 According to Savannah lore, Miss Florence lived with her brother in a lighthouse on Savannah harbor between 1887 and 1931. During that time, she waved hello and goodbye to every passing ship in the harbor. Historians estimate she waved some 50,000 greetings. And for that, she gets a statue! After we waved so long to downtown Savannah we headed to the outskirts of town to find quilt fabric. I missed Alabama and had yet to spot a quilt shop in South Carolina, so I decided to shop for three states in one! Clockwise from upper right are the fabrics of Georgia, Alabama and South Carolina. The clerk at Colonial Quilts asked if I was from out of town, and gifted me with an additional fat quarter from their "hospitality basket". Nice touch! 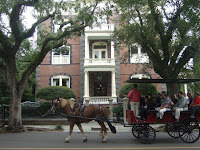 We enjoyed our brief stay in Savannah very much. We're already looking forward to a time when we can come back. Next time we'll definitely stay awhile.